Prepare to let me make you feel old: Gmail, Google’s much-celebrated email service, is already in its tenth year, and although we did get ourselves in a bit of a tizzy when the Big G first launched Gmail on April 1st, 2004 as a beta-only service, it has continued to go from strength to strength ever since. Google has, quite naturally, done a little reflecting of its own as the 9-year mark passes, and couldn’t resist a little self-congratulation to boot. 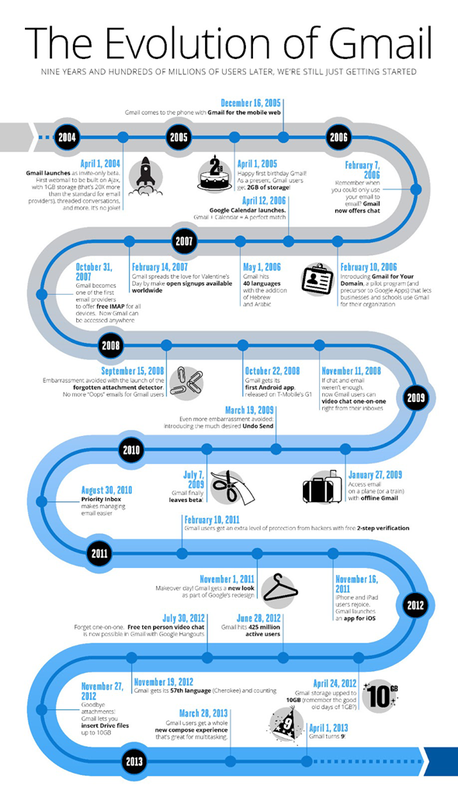 Below, Gmail’s biggest achievements and landmark occasions since April Fool’s in 2004 are illustrated in a rather pretty infographic, but if you thought the search giant was about to rest on its laurels, you’ve another thing coming! “We’re still just getting started.” That’s the defiant message atop a meandering timeline crammed with information on language expansions, key integration dates, and greatly useful features such as the forgotten attachment detector. The infographic itself is awash with numerous milestones, but personally, I don’t really actually recall anything significantly changing during the past decade. But this, however, is not a negative statement, rather just a testament to how well Google has moved along with the times. They say a good referee or umpire is one that does a great job, but steers clear of any controversy, and in the case of Gmail, Google certainly knows how to provide a vehemently efficient, evolving service without throwing in any reasons for its user base to become disillusioned. Like, I presume, many of you, I swear by Gmail, and simply wouldn’t want to go with any of the alternatives on the market. Don’t get me wrong, I have an account with Yahoo!, another with Microsoft, and several others, but for everyday, top-of-the-line functionality, Gmail does the job with aplomb. Google being Google, there was always going to be a reminder that these 9 years are, in fact, just the beginning, and if these statements are not just chest-beating hot air, it’s pretty frightening to think how good Gmail will become a further decade down the line. If the past 9 years have told us anything, it’s that Google really does know how to run a great email service, and although competitors would disagree, nothing else really comes close.